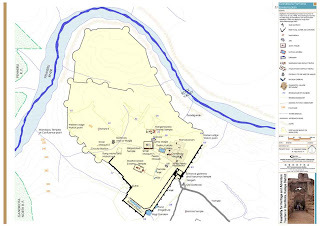 Great Hyderabad Adventure Club - GHAC Blog: Interesting Information on Gandikota fort. The information published on gandikota in this post has been sent by VijayPavan. Thank you very much vijay, for the information you have provided. 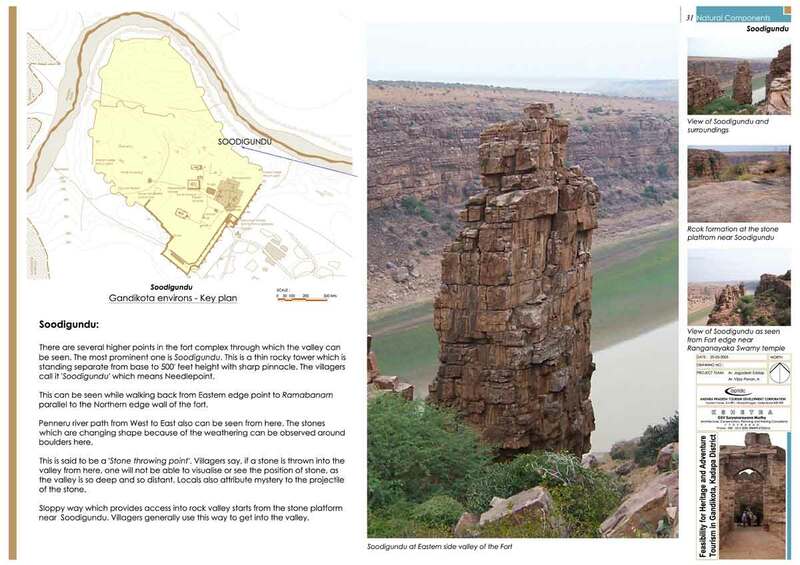 I did visit Gandikota several times before while practicing as architect in Hyderabad. Me along with a team of architects explored the place five years ago as part of a project to develop tourism related facilities (includes adventure) under APTDC. The project was pushed by the then CM Dr.YSR. I led the team under the supervision of principal conservation architect of Kshetra Architects, Hyderabad. 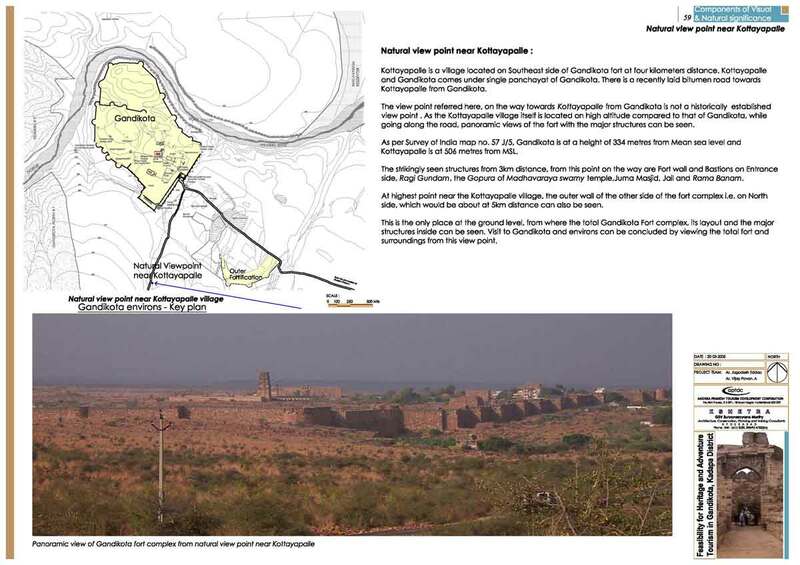 Our job was to identify and document the components for tourism in the Gandikota fort and village and prepare guidelines for the same. Based on our report only further development took place and is still continuing now (The newly built accommodation facilities out side the fort). The place has great significance in terms of geology (quartzite stone in sedimentary form & Gorge), archaeology, architecture (Vijayanagara and Quli qutb style), sculpture, irrigation (earthen pipes connecting several water bodies - built 500 years ago), culture, language ...etc. After 12th century many kings and their reigns showed interest towards the place right from Western Chalukyans to Vijayanagara kings (Sri Krishna deva raya) to Hyderabadi muslim rulers (Quli qutbs) to Tippu sultan to British. 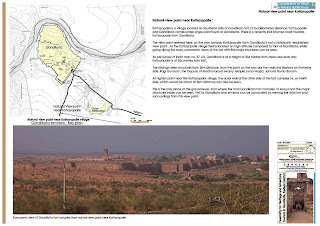 The reasons for not knowing this could be attributed to the remote location and Gandikota was never a primary capital, it was most of the time a secondary or a tertiary one. The entire fort wall has a perimeter of five miles (makes it one of the largest forts in India) and the length of the gorge is about 4km and depth upto 700 feet at certain locations. Few villagers have ancestral links to the original occupiers of the fort. The language, dialect and the kind of dresses they wear bear the original footprint of the place. Villagers have a very distinctive style of sports and games (typical to Rayalaseema) which can be witnessed during annual ritual happens after Ugadi every year. The names to the several places within the fort (Veerabhadra banam, Rama banam, Soodigundu) give an idea about linguistics development in the region. Along with two big temples and masjid, there are many structures unexplored on the site. There are few secret paths to the valley through caves, one of them can be observed near the western edge of the fort. There were many interesting ways in which the people used to catch leopards and other animals moving around. You could even see now, some of those traps built with stones. ASI employees there in the site have few pictures and maps. They and villagers are quite helpful to guide throughout and offer insightful & hilarious (sometimes not authentic) info. We thought of conducting an exhibition at Hyderabad with the pictures of the place but back tracked later only to prevent misuse of the place till the Govt. facilitates the tourist's requirements there. Any way, I am happy to share this now! I can only say that RAYALASEEMA is a hidden treasure for the daring and adventurous. The added bounus is the serenity and isolation this place offers you. yesterday only I visited that place. It`s amazing. But we have to preserve that. And we can stay there in A.P.Tourism resorts which is very comfortable and with cheaper rates.And you can have a pleasant weather if u visit in November to February.The archeological team is very good there. The direct descendants of Gandikota Pedda Kammavaru living as extended families from Kilacheri,Pannur, Molasur, Valarpuram & Nammianthal villages in Northern Districts of Tamil Nadu paid their homage to their ancestors at Gandikota on 1.10.10. It was an amazing breath-taking experience only to be felt. Great to be part of this memoable trip to our Gandikota. About 210 of us from our villages participated. superb info pawan, btw,..who made the infographics? Hi guys u can watch photo's and read history in my Telugu blog, this's my birth place..! but this is Telugu language blog. Do one need to be a skilled trekker/ rock climber to visit this place? Can a family spend time here safely for couple of days? Or the isolated place can be unsafe? Hi Durga: If you have never been to treks then it is recommended you begin with easy ones, rather than going for tough ones. You can call GHAC office to get specific information on a particular trek about safety and other things.